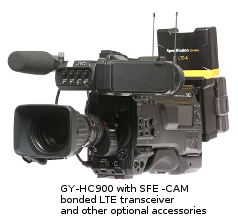 JVC has taken connectivity to the next level with the GY-HC900. The camera incorporates a new processing engine that enables recording and low latency streaming, and simultaneous decoding for return video and IFB. Talent in front of the camera can engage in a 2-way interview with return video and audio while streaming live to airÃƒÂ¢Ã¢â€šÂ¬Ã¢â‚¬Âall of this without any external boxes or backpacks. Depending on the mode, latency can be as low as 500ms for both outgoing and incoming video. Cellular bonding takes place with the optional snap-on SFM-CAM2 module, or with a Wi-Fi connection to one of our bridge units.